Hi there, my darlings! As many of my near and dear ones will attest, I LOVE fragrances--whether they be body sprays, body washes, lush soaps...or a special perfume. I have things that smell good and brighten my mood stashed all over my house and workspace--there's nothing that uplifts me on a gloomy day than a whiff of a bright, sparkling floral! Aromatherapy has been a part of my life even before I knew it was a thing. I'll credit this to my mother--the woman always looks good...and ALWAYS smells good! 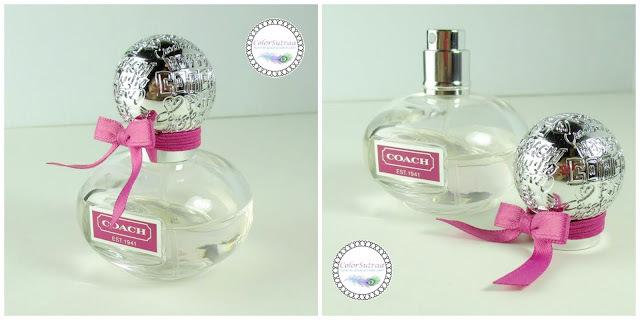 So, recently when the lovely people over at Beautyspin.com offered to send me a product of my choice to review on the blog, I immediately zoned in to a fragrance I've been dying to try--COACH Poppy Flower. IMPRESSIONS : First, let's talk packaging. Presentation is always important to me, especially when I'm picking up a luxury item. Fragrances are not cheap and I want that bottle to look GOOD on my dresser! Coach nails it...hands down. The box. in shades of fuchsia, white and silver is eye-catching and fun but it's the bottle itself that's the real winner! Delicate, girly, accented with a silver stopper and a fuchsia bow, this DOES look good on any dresser! As for the fragrance itself, I'm in love...absolutely IN LOVE with this scent! I cannot count how many times I've been stopped by strangers to receive a compliment on this scent. Or how many times a loved one has stayed in a hug a couple extra seconds and then gushed about how good I smell! It's light enough even for these scorching summer days but long-lasting enough to last well into the night. If you love feminine florals which are not too overpowering, you'll love Poppy Flower! So there you have it, my darlings! 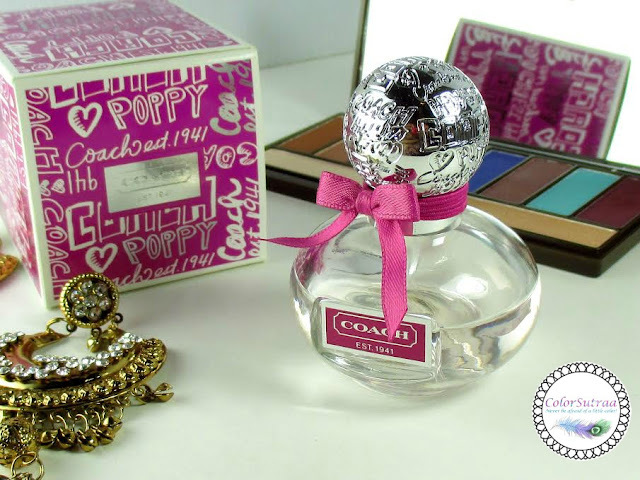 If you would like to add Coach Poppy Flower to your stash or pick it up for a loved one, you can find it at a great price on Beautyspin.com HERE. What is your current go-to fragrance? I'd love to hear your opinions in the comments section below! This fragrance sounds lovely! I love feminine florals! I've had a few samples of this, and I LOVE it! It's a great floral for spring/summer! I'm doing Flowerbomb, right now. I've sniffed this one and I wouldn't turn it down. It sounds like a lovely floral. Your picture composition is beautiful. I don't wear fragrance so I can't comment on that but it all looks so pretty. I had no idea that Coach also makes fragrances! This sounds devine, and that bottle is so pretty and feminine! I love the bottle! I think I have a sample of this somewhere, but I haven't tried it. I'll have to test it out. I will have to give this a whiff! I always wear Stella by Stella McCartney. I'm so bad about branching out! But this one sounds really nice. This one smells so nice. Love it.